It's your turn to spin the most lucrative wheel of all: the Wheel of Wealth! Click here to play! There are spectacular prizes on offer for anyone who can spin up the triple wheel jackpot, so get down to the slots today and start spinning! Wheel of Wealth is a great 3-reel slot played across a single pay line. There are three coins available to be played each round, with the more played increasing your payouts. The Wheel of Wealth logo is Wild and can substituted for any other symbol on the reels, except Spins, in order to complete winning combos, up to 5000 coins in one spin! The Spin symbol can appear on the third reel when all three coins are played; if it shows up, you will be sent to the exciting Bonus Room. Once inside you will spin the Bonus Wheel of Wealth for your chance at winning up to 1,000 times your original stake. Try your hand at the Wheel of Wealth and walk away a winner today! 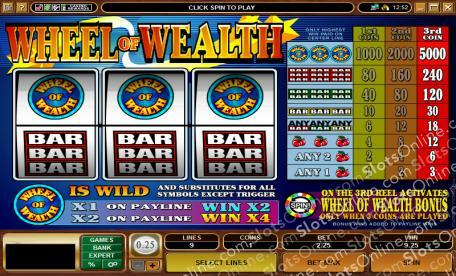 The Wheel of Wealth logo is Wild and can become any other symbol on the reels in order to win up to 5,000 coins. Whenever you play three coins, the Spin symbol can appear on the third reel. When it does, you will be sent to the Bonus Room to spin the Bonus Wheel of Wealth.